I once sent him a birthday card to sign for my dad. He signed it and returned it within a couple of days. Everyone who's met him says what a gentleman he is. A real rarity amongst current top footballers. When my Dad was a lad he wrote a letter to Sir Tom asking if he would come and play football with him and a few of his mates, and he did! Can you imagine any footballer doing that now?! My dad still has the letter! I remember Sir Tom's last game, as a six-year-old sat on my father's shoulders in the East Pavilion Paddock. Shame he could not go on for ever! Legend doesn't cover it, if Tom was playing now, Ronaldo, Messi, etc, would be in his shadow. Tom gave my fiancée her nursing degree. Tom also signed a splash photo for me a few years ago, a gentleman and one of Preston’s greatest! It was 1974 after Liverpool had beaten Newcastle in the FA Cup Final and David Coleman was interviewing Shanks. "Well Bill," Coleman said. "You've played with and managed some of the greats, so just how good is this lad Keegan? Is he as good as Tom Finney?". Shanks paused for a few seconds and then slowly replied: "Aye... he is - but Tom Finney is fifty two". Say no more. I remember Sir Tom coming to our house to sort the plumbing out when I was knee high to a grasshopper. Tom Finney is a truly great man and true legend. I remember going to court in younger days and Sir Tom was on the bench. I had a Preston North End top on and he said to me just because I had the top on, it won't stop me going to prison. I got for three months - nevertheless Sir Tom was a proper footballer and a great man. 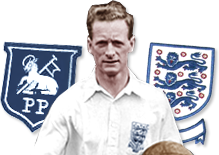 None of us Prestonians need to big Tom Finney up, he's the club's hero. Big Tom used to travel to Preston games on the back of the bus with the fans. Preston till the end. Mr Finney has done so much for Preston, not just on the football field but for charities as well. He was born and bred here and has a passion for the town. He has been a great ambassador and really deserves his knighthood.